In my sojourn on ink, I mentioned jovially that it is virtually dirty water. This means, most of what we know about surface tension of water applies to ink. Surface tension determines the degree and style of contact with other materials and is the cause of Capillary action. Surface tension is the reason why liquids form drops in free fall, sometimes perfect spheres. A good example is a pellet or shot tower. The diameter of those spheres depends on a material’s characteristics and the environmental condition. Drops sitting on a surface attain a shape depending on the characteristics of both, the liquid as well as the surface. The quality of the latter is called the wettability. A dewdrop sitting on a leaf: The waxy surface of the leaf is non-wettable, and the drop pulls into a shape with the smallest surface area, a sphere, thus minimising the contact area. I am not going to elaborate on the general aspects of physics and chemistry on surface tension. There are excellent articles on the net. I like to refer to Wikipedia. Let’s look at the physics, as far as it concerns the feed and ink. In drawing 1, you see the above photos expressed in physics terms. They describe what is called surface reaction (including characteristics of gas, liquid and solid), whereby wettability is expressed by the contact angle θ, pronounced theta. The above sketch of drawing 1 describes the situation in the photo 2, the dew-drop on the leaf. 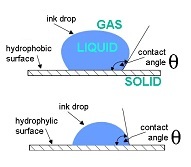 The more non-wettable, hydrophobic a surface is (gas or solid), the more a drop contracts into a sphere and reduces the contact area, the larger the contact-angle θ is. It is measured on the inside of the liquid. Vice versa, shown in the lower sketch of drawing 1, the more wettable, hydrophilic a surface is, the more a drop spreads itself onto the surface, and the smaller the contact angle θ is. This describes the situation in photo 3. Surface reaction also applies to vertical or sloped surfaces. This spreading and contracting of the liquid’s skin causes the rise or suppression of liquid between two plates with a narrow enough distance and also in pipes (round, square or rectangular) of small enough cross-section. This is called the capillary action, and I describe it in the next chapter on Capillaries. In drawing 2, you can see the same liquid (grey colour) rising to different levels. You can regard the red or blue lines as parallel surfaces or tubes. In the latter, the liquid would climb higher. Trust me. The surface of the red material is hydrophilic (small θ), that of the blue is hydrophobic (large θ). The container’s surface is neutral (θ = 90º). I added the green line for easier comparison. In the middle is a situation where one surface is ‘blue’ and one ‘red’. You can see how the combination of material and distances of the plates influence the rise or the suppression of the liquid. Take a moment and evaluate the image. It is good to develop a sense for this, so you do not need to think about it later when we talk about the design of the feed. In a fountain pen, we have at least three different materials in contact with the ink: the tank or cartridge, the feed and the nib. Therefore, their surface reaction behaviour will vary, sometimes to our advantage, sometimes not.